Morocco’s moderate Islamists of “Justice and Development Party (PJD) have won 99 out of the 395 seats of the House of Representatives, according to official preliminary results. 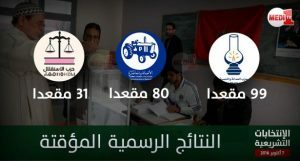 With 90 pc of the votes counted, the ruling party of head of the government Abdelilah Benkirane gained 99 seats, while its major rival, the Authenticity and Modernity Party (PAM), grabbed 80 seats. The Istiqlal (Independence) Party – the oldest in the country, founded in 1944 – came third by winning 31 seats. Among the other parties, provisional figures showed the National Rally of Independents (RNI) winning 30 seats, while 21 seats were taken by the Popular Movement (MP). The voting unfolded smoothly but turnout among the 16 million electorate stood at 43 pc, according to the Interior Ministry. Voter turnout in the 2011 parliamentary polls was 45 pc, while in the local elections of 2015 the turnout was 53.6 pc. According to Morocco’s constitution of 2011, the Head of Government is selected from the party that wins most votes in the election. The ballots of October 7th are the second parliamentary elections held in the North African Kingdom since constitutional changes were enacted in 2011, during the Arab uprisings. About 30 parties competed for the parliament’s 395 seats, 90 of which are reserved for women and candidates under 40. Despite political parties’ disappointment over low voter turnout, they all agreed that the polls unfolded in total transparency and freedom, and reflected the maturity of Morocco’s democratic process under the leadership of King Mohammed VI. Politicians and observers underlined that this new democratic exercise and the commitment of the Moroccan people to its success confirmed, if need be, the exception of the Moroccan model and the Kingdom’s status as a beacon of stability in a regional environment marked by uncertainty. Written by: Jaber Ali on October 8, 2016. Posted by Jaber Ali on Oct 8 2016. Filed under Headlines, World News. You can follow any responses to this entry through the RSS 2.0. Both comments and pings are currently closed.